Today is the seven year anniversary of my cancer diagnosis. I am blessed to still be cancer free after being told initially I was beyond treatment with a very poor prognosis. It’s been a long and tough road, but my life is immensely richer than it was before cancer. • I created and published my web site Appendix Cancer (Appendiceal Carcinoma) and Peritoneal Surface Malignancy and it has had 50,000 hits. I also published my blog and via my blog and website, I have communicated with over 350 patients newly diagnosed with appendiceal cancer. • I’ve been in touch with over a dozen surgical oncologists who specialize in treating those of us with appendix cancer and they have all been gracious enough to support my advocacy efforts. • My daughter’s senior class published a book about 33 people they identified as local heroes. One of the chapters was about my cancer experience and my cancer advocacy efforts. My kids have also used our family’s experience as the subject for speeches and papers and projects. My eldest daughter’s senior Personal Impact Project was creating over 1000 appendix cancer ribbons that she’s distributed to promote appendix cancer awareness. My cancer experience overall has made us closer as a family. We view life differently. • I was invited to attend the annual meeting of the American Association for Cancer Research for 5 days in San Diego this April. There I will participate in the Survivor<->Scientist Program. I’m sure I will meet many inspiring advocates in addition to research scientists involved in the search for cancer cures. I know I will learn much that I will share here when I get back. • I was asked by someone who read my web site and blog if I would be a contributor to a new on-line medical encyclopedia. I’ve written an entry about appendix cancer for the encyclopedia. • I have founded and am in the process of developing a non-profit organization to support those of us diagnosed with advanced abdominal cancers, including appendiceal cancer, who need extensive medical treatment including cytoreduction surgery, peritoneal and/or IV chemotherapy (more about that later). • My kids both completed grade school and junior high school. My eldest will graduate from high school this year and begin college next year. Next year my youngest daughter will graduate from high school. It’s what I prayed so hard for, to live to see my kids graduate from high school. If that’s all the time I get I’ll be grateful and satisfied with the length of my life here. • I joined a Toastmaster’s Club that I love and that has introduced me to several new friends. I’ve given 7 speeches there. I also volunteered at a soup kitchen for 2years that served hundreds of people and I made several new friends there also. • I’ve taken up backpacking and have been on 5 backpacking trips, including one on the Appalachian Trail, a place I’d always dreamed of going. • I finished my first ever bicycle century, the Apple Cider Century; 100 miles in one day. It was something I’d always wanted to do. • I celebrated 7 more Christmases, Thanksgivings and Easters and all of our family birthdays with my husband and kids. I got 7 more springtimes. • My youngest daughter and I did a Mother-Daughter weekend in Chicago, complete with a spa day, and my eldest daughter and I were able to see John Williams conduct the Chicago Symphony Orchestra and to see Wicked performed in Chicago. • I finally made peace with my God and for the first time in my life became the member of a church. Life has been rich and good. I do still live pretty much one day at a time. I don’t take time on this earth for granted, but now I also just see my time here as a small piece of my whole life, so I’m not as heavily invested here. And I invest more in my relationships with my husband and kids. I prioritize my time differently. It hasn’t been an easy 7 years, it’s been long and hard. Surviving cancer isn’t easy, it’s difficult. Life has never again been as easy as it was before cancer. There have been many struggles after the initial physical battle was over…struggles mentally, emotionally and spiritually. But I am better for the battle, I think. I’ve tried hard to make my short life here count for more. I truly hope I’ve made a difference….that I’ve honored the gift of my survival. That I’ve honored the gift of being able to see my kids grow up. I remember reading about that before, and being aware that some people travel overseas to obtain comparable quality medical care for a fraction of the US cost. In many cases, paying cash for a procedure overseas is cheaper than just the insurance copay cost for a procedure performed in the US. 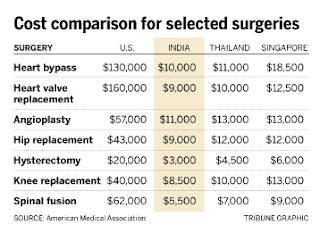 In the Chicago Tribune article, an uninsured 55 year old man who needed a liver transplant and couldn’t afford the $450,000 price tag in the US went to a premier hospital in India and paid $58,000 for the same surgery. The price including his 10 week hospital stay. I would love to know the cost in India for cytoreduction surgery and HIPEC if it is offered there. I wonder if that would be an option for those in the US who are uninsured or whose insurance denies payment for the procedure. I had a similar experience with medical cost variations within the US. I had two portacaths. I had one removed as an office procedure in another state at a cost of $350. I had the second removed locally, but my area did not offer the surgery as an office procedure. The cost for the removal of the second port locally in an outpatient hospital surgical suite was $3500. I had local anesthesia and was awake and watched both procedures. They both were similar procedures and took the same amount of time. I remember thinking my insurance company would have come out ahead had they’d paid airfare, food, and hotel cost for me to have the second port removed as an office procedure out of state. Apparently insurance companies are starting to pay attention to details like that and some are offering first class transportation and lodging for those willing to have procedures performed in other parts of or outside of the US. There are other ways to save on medical costs. I tried to watch dates to stay within annual deductible dates and annual out-of-pocket expense limits. I also kept track of procedures, dates and insurance payments. I saved over $10,000 in billing errors I discovered in addition to double billings, insurance failure to pay for covered procedures and charges that I challenged the insurance company about until they agreed to pay. It took me many hours of phone calls and being on hold, but at $10,000 savings, it was well worth my time. A cancer diagnosis and treatment is stressful enough, but the costs of medical care can cause additional stress when combined with a loss of income for those who are sometimes unable to work for several months. It really pays to be a careful consumer in the medical world. I would not join a cancer support group after I was diagnosed. I was tough, I was strong. I didn’t need to be in a support group with other cancer patients. Support groups seemed to me to imply weakness, they were for people who couldn’t handle it. I could handle it. I didn’t need help. But deep down, there were other reasons I didn’t want to join a support group or spend a lot of time in the company of others diagnosed with cancer. I was afraid I might watch someone in my support group have a recurrence and die of cancer. That I might have to support them as they succumbed to the enemy that I was fighting. Would I be able to do that? I was afraid that someone just like myself who thought they would “beat it” would lose their battle. I knew that would make me feel vulnerable, that it might destroy my resolve and certainty that I could beat my own disease. I was better off in the healthy, cancer-free world. It was safer. I went through a very great struggle in my survival after awhile, though, after treatment. I was stuck. I was healthy, but still a “cancer patient”. I was still tested often, I still saw oncologists frequently. I never new if each test would hallmark my return to the world of active cancer. I wasn’t really well and normal again even though evidence had so far declared me cancer-free. I was instead in a continuous watchful waiting mode. I was just kind of on parole from cancer. No one would call me cured. So it wasn’t really over. I was struggling. And no one on the “outside” could understand how I felt, I’d finished the hard part, surgery and chemo, and had good test results. Why should I be struggling in light of such a positive outcome? Then I found the book “Dancing in Limbo: Making Sense of Life After Cancer”. I was so very relieved, someone understood how I felt and even put words to my feelings. But that’s because the authors were cancer survivors, so of course they could relate to how I felt. After that I joined for a short time a “Wellness” support group for those who were struggling emotionally after treatment. Some in my group had recurrences and died. We had candles present at meetings to represent the spirits of those who had gone before us. And it was okay, the group gave me a sense of peace that had evaded me until then. It made me strong enough to reread all of the medical research about my cancer so that I could construct my web site. It helped me find the courage to become a hospice volunteer for 6 months so I could also learn how to support those who wouldn’t survive our disease. Now, since publishing my web site, I communicate with cancer patients every day. Cancer is a large and very real part of my daily life by choice. Almost by default via my web site, I am now part of a large group of cancer patients who support each other….you could actually call it a cancer support group. The irony is that in the end I love being part of the community of those diagnosed with cancer. I love the support we can provide and accept from each other. I love the easy and natural way we communicate with each other. I love the sense I have of feeling at home with other survivors. I got to thinking, I also love being a member of my Toastmaster’s Club, we call ourselves the Executive Diction Club…it is a group that supports my objective to become better at public speaking. When I think of it, that’s also a kind of support group, its just called a club. I’d probably not have wanted to join if they were labeled as a support group for those who find it challenging to speak in public. I wonder if we should just find another name for “cancer support group”. A name that sounds sheik and nifty and cool and that makes us instead sound like an elite club. Something we’ll all feel privileged to be a part of considering our exclusive and strict requirements for joining. Only those tough enough to walk the cancer walk can be allowed as members. Not just anyone can join. Only the few, the proud, the cancer-afflicted can participate. We might actually have a lot of very profound fun (those in the cancer community can have a GREAT sense of humor), share meaningful insights, maybe in the end even be instrumental in curing cancer….who knows what great potential our club could have. We might change the world. Any suggestions for a name for our club, anyone want to join? Only those with a cancer diagnosis allowed. In part maybe because I’m middle aged, and in part maybe because I’m a cancer survivor, I’ve been recently counting my blessings. I get nostalgic sometimes. When I count my blessings, the richest blessings in my life have all been people. My husband has loved me unconditionally for the past 23 years. He has loved me more than I think anyone else in my life ever has, he is my life’s greatest blessing. I am also blessed to have very close relationships with both of my amazing daughters. They are people I love spending time with and that I would admire and love even if they weren’t my children. They teach me a lot. I have a wonderfully strong and inspiring mother. I also have three amazing sisters who are also inspirational to me. They all supported me so much even from a distance when I was diagnosed and going through cancer treatment. And of course all of my husband’s family, who have also been true family to me for decades and who were such a great support to me, especially through my cancer experience. I left home at a young age and haven’t lived near my family of origin since age 17, but when I think of it, I have always been surrounded by “family”. Richard and Dorothy were like adopted parents to me from the time I left home. They were a middle-aged couple I met when they came into a restaurant where I waitressed at age 17. She said I looked just like her daughter, who lived about 4 hours away from them. When I mentioned my parents lived equally far from me, we decided to adopt each other. We became family and played penny anny poker every Friday night, canned tomatoes together, we talked, we ate dinner together often and we spent holidays together. Their home was my second home. Though they are no longer living, they gave me many good memories of times we shared. My father-in-law at that time and I also became very close. We fished together, worked on finishing wood together, had coffee together and talked every week. I loved him a lot. He also passed many years ago. I had a very elderly neighbor I adopted and helped when I was 18, Anna. She taught me so much about character and what it was like to live on a limited income as a blind amputee. I have since respected the aged because of her and have adopted elderly neighbors as family ever since. I try to be the family they need as I hope my mother’s neighbors are also family to her. Anna taught me that life is a circle, we all need to be each other’s family especially in this day and age when many don’t live near biological family. And there’s Art, my other “adopted” dad. I met him when I worked at a soup kitchen. He is a man in his 80s who is active and giving and independent. He comes by my house often for coffee, we listen to each other, we support each other, he helps me if I have a problem. He is a grandfather to my kids and never forgets theirs or my birthday. He listens to me. He gives me a hug every time I see him. I have a best friend of 28 years who has been there and shared every important event in my life for almost 3 decades. We knew each other when we dated our prospective husbands for the first time, we stood up in each other’s weddings, we raised our kids together, and are becoming empty nesters together. We’ve shared together college experiences, work and personal struggles and faith journeys almost our entire adult lives. And I feel the same sense of family now with the many I communicate with who are diagnosed with cancer. We are all related, not by blood, but by disease. We share a lot. The same fears, the same anger, the same physical, emotional and financial struggles, the same sense of hope and the same sense of loss. We can say “you know how I feel” and we always do. I am inspired by so many I’ve met with this diagnosis. I have learned so much from them as I continue my own journey. I have been blessed to be part of the cancer community. So, I was thinking of how rich my life has been. Rich in the best way. Rich in relationships. Rich in people. There is no greater wealth. I don’t know if “reruns” are allowed in the blog world, but I posted this one for the first time almost a year ago. I thought that because I’ve been talking about pain in this life, and because it’s the first day of spring, maybe it would be okay to rerun this particular blog entry. Good things do come from pain. Be sure to watch the video, it’s amazing. In this entry I want to do something different. Celebrate the cancer experience. Yes it’s tough. It knocks us to our knees, it humbles us, it changes us forever. Only we who have “been there done that” really understand how it changes us, what it does to our hearts and souls and bodies. But we become part of a new community of survivors, and many of us love that community and the people we meet here. Someone spoke to me recently about the different ways each of us “rise out of the ashes” of our cancer experience. I think most of us are changed for the better. I see life nowadays as a school, problems are the curriculum. Bigger problems are the tougher classes. Those of us living with a cancer diagnosis have been taking the advanced classes, the astrophysics courses of life. Sometimes I think of the “Why Me” part of the experience and think in reality, maybe it was because I was worthy of a promotion to advanced life courses? Maybe I got to skip a grade? At this point I am very grateful for what I have learned. I am actually thankful for the experience. I know, it’s easy for me to say that, I’ve already out-lived my life expectancy and made it to the 5 year mark. I’ve only recently been able to feel grateful for the experience. I got to thinking that many of the truly honorable and good things I see in our society started from profoundly painful beginnings. I am a musician, as are my daughters. One of my daughters just turned me on to this video on Youtube. Wow. I’ve watched it over and over. I love the video, I love the lyrics, I love the music. Please watch the video and listen to the music. It documents some great things that have resulted from very difficult circumstances. I would like anyone who knows of more examples like this–a difficult time someone experienced that motivated them to make a positive change in our world, large or small, to please let me know the story or to add it as a comment to my blog. I’d like to celebrate the good things that come from tough times, celebrate the good that comes from even a cancer diagnosis. Anyone else have examples of great things that have arisen out of the ashes of someones difficult journey?